Boil the raw plantain & remove the skins. Heat oil in a pan, add red chilles, urad dhal, tuvar dhal,hing,salt & sauté . Add to the blender to make a coarse powder. Now add the boiled raw plantain & coarsley blend along with the powder . Heat oil in a pan, add mustard seed allow it to temper & add to the podimas. Check the seasoning & Serve Rice with ghee. One of my favourite, love with hot steaming rasam..yumm! Very delicious... perfect with hot rice and sambar. 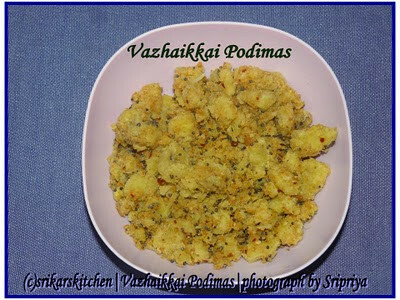 Simple and delicious side dish for rice..nice recipe.